A house with a shingle or slate roof often has extensions with flat roofs. This may be over a porch, a garage or in the back of the home. Michael J. Harris, Inc. Roofing and Masonry has the expertise to replace old, built-up roofs with new “rubber” roofs. It is very important when installing these types of roofs the old flat roof is torn off down to the wood deck before installing the new one. Never go over an existing flat roof because it will not bond properly. 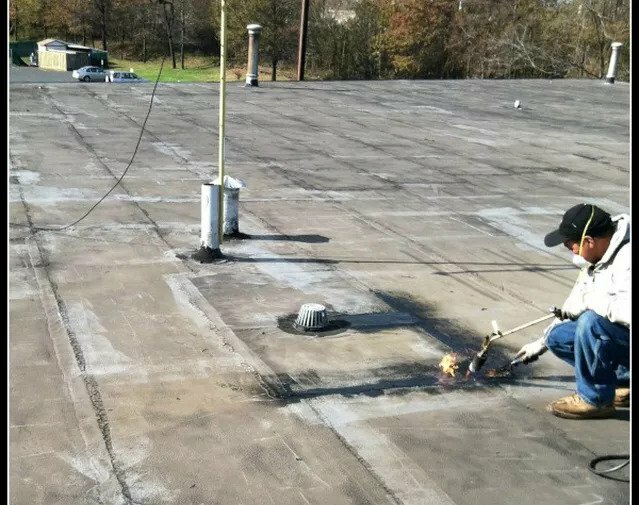 A rubber roof is actually made from by bitunum material which gives the roof more elasticity and are torch applied (heat). These rubber roofs last approximately 20 years. It is a good idea to “silver coat” rubber roofs which acts as a sun reflector keeping rooms cooler; cutting down on cooling costs and it is more environmentally friendly.